Top: Simplified geologic map of central Albemarle County (from Bailey & Flansburg, 2017). Bottom left: Megacrysts in the Mesoproterozoic Crozet Granite. Bottom center: Boulder metaconglomerate in the Cryogenian Mechum River Formation. Bottom right: Epidote boudin in foliated greenstone of the Ediacaran Catoctin Formation. This year’s field trip will focus on the Precambrian geology in the Blue Ridge anticlinorium in Albemarle County. The conference will be based out of Piedmont Virginia Community College, and led by Chuck Bailey, Megan Flansburg, Katie Lang, and Tom Biggs. We will examine metasedimentary and metavolcanic rocks in the Neoproterozoic cover sequence and Mesoproterozoic basement rocks exposed in the core of the anticlinorium. The trip will highlight the results of new research and geologic mapping completed over the past decade in the central Virginia Blue Ridge. Career Exploration and Mentoring Workshop 3 to 6 p.m. Attention students—there’s a new opportunity for you at the VGFC this year! On Friday, October 13 from 3-6 p.m. (in the Geology Lab, M850) there will be a career exploration and mentoring workshop held on the campus of Piedmont Virginia Community College (PVCC). This event is open to all students from two-year and four-year colleges and universities, and will include sessions on resume/cv/cover letter creation, interviewing skills, and an open panel discussion with geoscientists who work in a variety of professional settings. Come join us for a unique chance to network and explore where your geology degree can take you! For more information contact Karen Layou (klayou@reynolds.edu). Registration & Opening Reception 6:30 p.m. 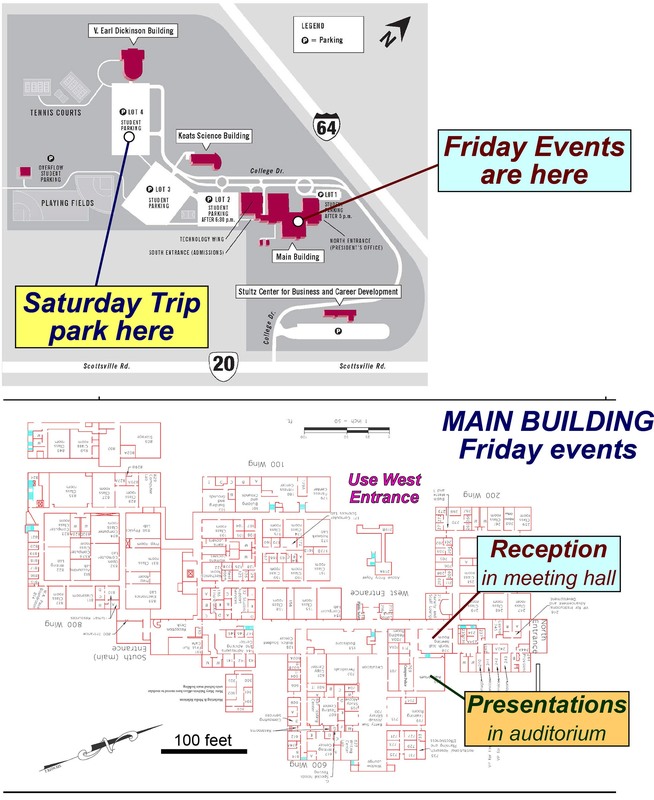 In the main building at the North Meeting Hall, PVCC (see map). Welcome, Business Meeting, and Presentations 7:00 – 8:30 p.m. Parking for these events in parking lot 1, 2, or 3 (see map). The Field Trip 7:45 a.m. to 6 p.m. Please arrive by 7:30 a.m.
Park in Lot 4, PVCC (in front of Dickinson Building, see map). Buses will depart from this location at 7:45 a.m. 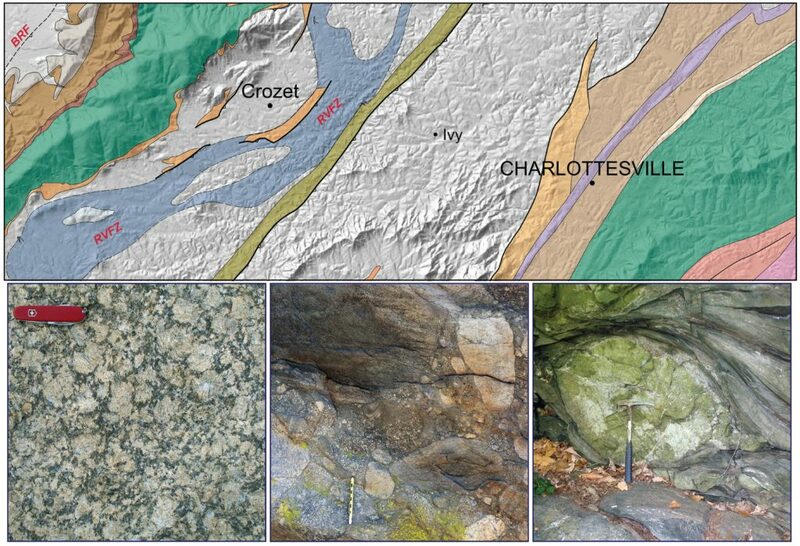 The field trip will visit a number of interesting geological stops in the Albemarle-Charlottesville area. Some stops require walking between ~300 m and 2 km round trip, most of which will be on roads or trail. Expect some uneven and hilly terrain. In mid-October the weather may range from summer-like to spectacular and suitably autumnal. Please be prepared with proper footwear and raingear as the trip will run come rain or shine. Return to Piedmont Virginia Community College Lot 4 at 6 p.m. If you have questions regarding the 2017 conference, contact Chuck Bailey at (cmbail@wm.edu) or 757-221-2445. Charlottesville has many lodging options, hotels close to Piedmont Virginia Community College include: The Sleep Inn on 5th Street, and the Holiday Inn on 5th Street. Developed private campgrounds near Charlottesville include the Charlottesville KOA (~7 miles south of PVCC) and a the Misty Mountain Camp Resort (~12 miles west of PVCC).